Tom Volckhausen: Will Boulder embrace change? Published in the Boulder Daily Camera on January 31st, 2015. Recently, the Daily Camera’s Open Forum printed anti-development letters alarmed that a “new Boulder” being built might harm the attributes of the Boulder we all love, ranging from small-town charm to elbow room in open space. While I do not agree with these letters, I respect the sentiments. It is positive that residents care passionately about our community. There is a rising number of equally passionate residents who have another vision of Boulder’s development future. It is not another Denver but a more dense, walkable and diverse community based on the historical precedents of our own town. Should everyone who wants to deserve to live in Boulder? No, but we shouldn’t be slamming the door either. Nobody expects we can take all comers. Can we set a reasonable goal to accommodate some who want to live here and can contribute to our community? This might include a mix of service workers, young people, single parents and others. Ask yourself this: Could you afford to move to Boulder today? If your kids have moved away, could they move back and live independently while launching careers and families? Average price of single-family homes in Boulder is $830,000, limiting purchasers to very wealthy people. Shared rental houses are being rapidly converted to upscale residences, eliminating a historic source of affordable rentals. Middle-income families can only qualify for townhomes, condos, and apartments, which the market calls for because they are in short supply and high demand. Will building more dense development and transit change people’s driving habits? Looking at national trends, yes. Transit ridership and walk scores are growing nationally, but only in areas that are denser, have walkable streets and paths, local services, and good transit. Build it and they will roll differently. I don’t expect my Baby Boomer cohorts to change their habits, but today’s boomers may soon wish to age in place while giving up driving. Meanwhile the younger generation is much more likely to forgo car ownership, ride bikes everywhere and use transit. Do we build for today’s population or tomorrow’s? 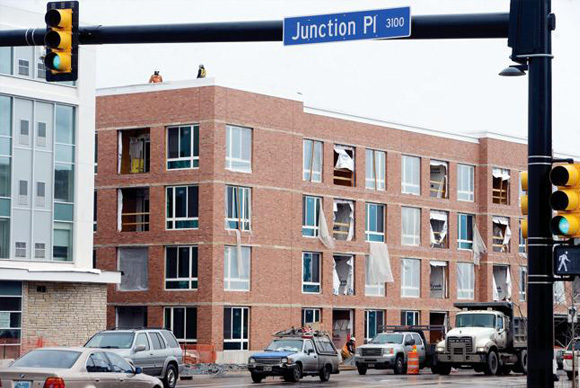 Is Boulder’s new development ugly? This is obviously subjective. I don’t see architectural landmarks rising at Boulder Junction, but I do see architecture and urban design that exceed our region’s norm. When I ride my bike by new developments on 28th and 30th, I see many more pedestrians than previously. Establishing better design and concept reviews early in the process, and moving to form-based design codes, instead of floor-area-ratio limits and arbitrary population numbers, will improve aesthetics and create a more human-scale pedestrian environment. Heights and facades should be varied. Denver has shifted to form-based codes and created some wonderful buildings and exciting neighborhoods. Are “they” coming to take my neighborhood? Mostly new development recycles parking lots and vacant or underused industrial land nowhere near a residential neighborhood, but close to transit, bike paths and retail. Boulder remains an exceedingly difficult, uncertain and expensive place to build anything. Will keeping Google and similar companies out put a lid on housing prices and traffic? What if Google took those 1,500 jobs to Broomfield? Wouldn’t the high-paid Googlers still want to live in Boulder? And if not, wouldn’t they constantly be driving here to enjoy all things Boulder? Placing a major employer in the city’s geographic center at the terminus of regional transit just makes sense. Is the scale of new development unprecedented in Boulder? No. Much of Boulder west of Folsom is built in a dense, mixed-use walkable pattern that we can recreate through redevelopment of existing parking lots and strip malls. Building the Boulderado, Pearl Street, and Whittier would be illegal today. Recent developments like Iris Hollow, Holiday, Steelyards, and, yes, Boulder Junction, are steps in the right direction. If we accept change, will we regret it later? Maybe, but life is full of difficult choices in the face of constant change. The Boulder we moved to was proactive, known for sweeping, risky innovation in open space, affordable housing, and transit. The current development discussion sounds reactive, conservative, risk-averse, and intent on self-preservation. The reality is that global and Colorado demographics and technologies will change. Will Boulder adapt to and embrace change? Can we keep seeking solutions? Can we have a conversation beyond, “No”? Hopefully, some minds will open to the possibilities. Tom Volckhausen lives in Boulder.